What are your plans for creative practice this week? Given the specifics of your schedule, decide on a realistic intention or practice plan — and ink that time in your calendar. The scheduling part is important, because as you know, if you try to “fit it in” around the edges, it generally won’t happen. An intention as simple as “I will write for 20 minutes every morning after breakfast” or “I will sketch a new still life on Wednesday evening” is what it’s all about. If appropriate, use time estimates to containerize your task, which can make a daunting project feel more accessible. Share your intentions or goals as a comment to this post. We use a broad brush in defining creativity, so don’t be shy. We also often include well-being practices that support creativity, such as exercise and journaling. Share your intentions or goals as a comment to this post. Putting your intentions on “paper” helps you get clear on what you want to do — and sharing those intentions with this community leverages the motivation of an accountability group. Join us! 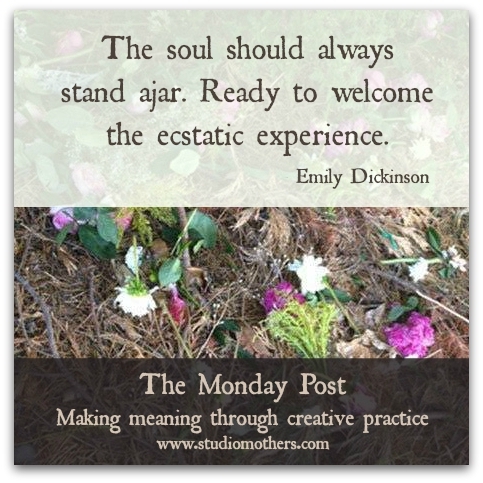 The image used in this week’s Monday Post is courtesy Betsy Gitelman. Thank you, Betsy! If you would like to contribute a nature image for a future Monday Post, please send an e-mail to creativereality [at] live.com ! Thank you for a great post! I need to be reminded often! One of my intentions is to journal more. I write, and also use pictures, decoupage, postcards, etc. I love doing it but don’t make time for it every day. That is why your post was so on point, and inspiring to me. Merci! Artist Mother of two, 13 and 11, middleschoolers whom I let in the door every afternoon. house organizing continues ( i have had a busy art career so house was on backburner, now it depresses me to have such a chaotic clutter filled house… so time to put on front burner.. haha fun, as i have two more art shows this year…. I try). This is inspirational. I have to remind myself that connecting with my creativity is a great thing.